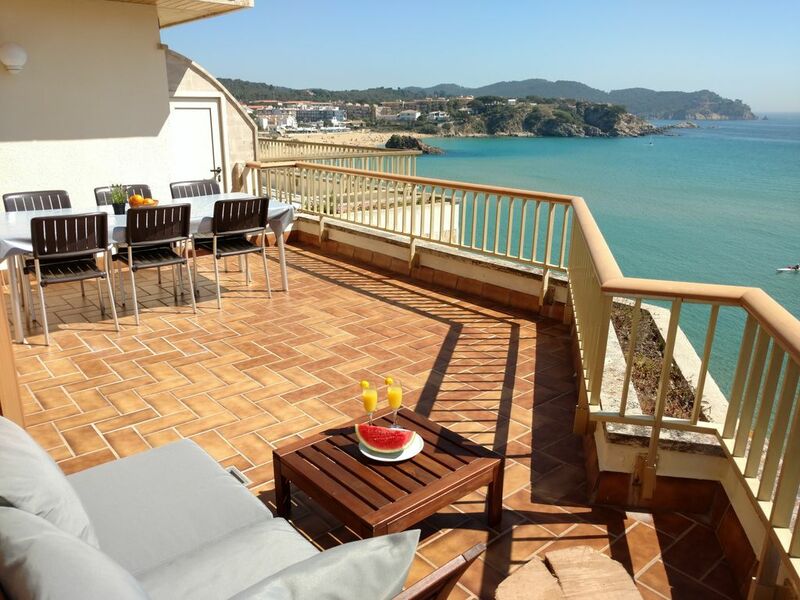 Charming apartment with large sun terrace and stunning views over the bay of La Fosca. The apartment is on the 3rd (top) floor and has 4 bedrooms. One room with double bed, 2 rooms with 2 single beds (can be moved together to a double bed) and 1 room with a bunk bed and a drawer bed. Furthermore there are: 2 bathrooms each with walk-in shower and toilet, a fully equipped kitchen with induction cooker, oven, fridge, freezer, dishwasher, washing machine and dryer. In the living room there is a large table with 8 chairs and 2 sofas. There is a television set with DVD player. On the spacious sun terrace are a terrace table for 6 people (extendable to 10 people), chairs and a terrace seat. If you prefer shade, a push of a button is enough to automatically extend the awning. You park your car sheltered on the ground floor. Handy are also the outdoor showers and the storage for the beach stuff. From the terrace you have a perfect view of your children playing on the beach. Pleasure yachts can be placed over the spacious swimming area in the bay on a buoy (against payment at the harbor master). Each bathroom is automatically ventilated. Modern high efficiency boiler ensures instant hot water. Bath linen for rent on request. The apartment is very uniquely situated, it is equipped to stay there for a long time. Even in winter it is very pleasant. There is a central heating system on gas and cooled in the summer the apartment. In every room and in the living room there is air conditioning which is controlled by device. (all units have a "sleep mode" so that they work almost silently.) The shallow water in the bay causes the seawater warms up quickly. We have 2 ladies bikes and 2 men's bikes available. Lejligheden levede fuldt ud til forventningerne. Alt var som beskrevet og hvilken terrasse med havudsigt😍�. Der manglede ikke noget udstyr overhovedet. En stor tak til Peter for hans viden og fortælling om området. Helt sikkert en lejlighed vi vil vende tilbage til igen. Thanks a lot for the positive feedback. Welcome again, whenever you want! Prachtig mooi appartement op een top locatie. Wir waren zu sechst und haben uns sehr wohl gefühlt.Die Wohnung hat vier Schlafzimmer, zwei Bäder, eine schöne Küche und ist mit allem für eine große Familie ausgestattet. Das Highlight ist die große Dachtersse mit Blick aufs Meer, zum Strand ist es ein Katzensprung. Der Kontakt mit dem Betreuer vor Ort war sehr angenehm. Können also die Bestnote geben und würden gerne wieder kommen. Appartement juste parfait pour une famille, idéalement bien placé les pieds dans l'eau !!!!!! Très propre et très bien aménagé, une chose est certaine, nous reviendrons l'année prochaine. Les propriétaires sont très sympathiques et très arrangeants et la personne qui vous accueille très agréable également. Nous sommes très contents que vous avez eu un agréable séjour chez nous à La Fosca. Merci pour votre réaction positive. Nette und Ruhige Lage. Fernblick - Genial! Apartment war genauso wie in Fotos. Gute Ausstattung. Gute Möbel (teils etwas billiger - trotzdem gut). In die Küche gab´s alles was man für kochen braucht. Sehr gut! sanierten WC/Dusch-Räume. Sehr bequeme Matratzen. Wir hatten so ein Gefühl fast wie zu Hause gehabt. Kontaktperson sowie Besitzer total nett, gut erreichbar telephonisch sowie per E-Mail. - Parkplatz sehr eng - für größeren/längeren Autos sehr schlecht geeignet. Für mich persönlich - ein Grill wurde die Aufenthalt noch besser machen. This is the best place to holiday if you you want to eat swim and relax in the sun. Price is reasonable and the location is excellent. We know 😉. Thanks for your positive review! Hope to see you next year. The bay of La Fosca is a gem on the Costa Brava. Located between the picturesque, lively Palamos and the Parque Natural Aigamolls de l'Emporda. Ideal for water sports enthusiasts, hikers, bikers and quiet bon vivants. The bay with fine sandy beach is flanked by the surrounding rocks and is shallow. You can enjoy a stroll on the pass. You can find food in the neighboring supermarket, for extensive shopping you can go to Palamos (2 km) at the fish market, the southern market or in the supermarket. La Fosca has a number of restaurants and terraces. For a night out, children's entertainment, sardanes, beach aerobics, etc. you can go to Palamos. La Fosca is a great starting point for cultural excursions to Pals, Girona, Figueras, Barcelona. Diving excursions o. A. To Iles de la Formigues. Countless mountain bike trails. Medical post in La Fosca, Palamos hospital at 3 km. Golf: In the vicinity there are 4 beautiful gof courses and 1 golf school close by, max. 20 km.